So, I haven’t been posting for the last few days because of college work – but I’m back now and ready to roll up my sleeves and start anew. Well, this week I’ve got a slew of smaller games that I’ll be talking about – also I want to provide folks with a heads up that I’ll actually be doing a weekly review for the Able Gamers Foundation – so I’m super excited for the opportunity! I’ll keep people posted, and I’ll be reposting any review done there 48 hours after they’ve been submitted. Now – onto today’s game shall we? Come to design games - Stay to become a legend. Game Dev Story is a mixture of RPG/Sim Game and it’s truly an addictive experience if you like simulation games. The graphics are definitely retro and the gameplay is simple enough, but actually learning how the game works and the strategy behind getting the best scores on your games is the real challenge of the game, which is why I got so hooked. You play as the owner of your own game development studio. Create games, train your staff, and try and become an award winning game studio! Working really bytes... unless you're gaming! If that sounds fun then you’ll probably love Game Dev Story. Now let’s break the game down in terms of it’s accessibility, because that’s the important part I love to focus on as a designer. I will start off by saying, that while the gameplay is sort of slow, the game is educational, simple to play, has heartwarming graphics, and definitely a game anyone should check out once. Game Dev Story has one-touch controls perfect for physically impaired or one-handed gamers. Graphics are vivid and color variations are different enough that colorblind gamers won’t have a problem with playing this game. Large print text for vision impaired gamers. Musical audio, but all directions and gameplay updates via text. Deaf gamers will be able to definitely grab this game and just play, without fear of missing valuable information. Simple gameplay is not only educational [ helps learn financial saving/spending business concepts ] but makes it easy to play for many players. Game time pauses for every time you make a change – helps physically impaired gamers play without fear of rushed decisions/gameplay. Large buttons for easy touch controls. Repetitive music score, while nice at first, can get old – but can be muted. The game development process goes by quite fast, and while nice, when the Free version only let’s you go 5 years into development – it can feel like a much shorter experience than desired. The game becomes far more difficult, not in gameplay, but in strategy. It’s a definite toss up when trying to determine which genre and style of game will sell well together – which may make the game harder for cognitively impaired gamers to be truly successful in the game. No real story to the game, so the only incentives are trying to get your popularity and games to win rewards – but that’s a fun experience in and of itself! Overall though, this game is a heartwarming throwback to the retro-sim games of old – and a wonderful experience to pass the time as a designer. If you’re interested I would totally recommend grabbing up the FREE version from either Android or the Apple App Store. This version will last you for about 2 1/2 hours of gameplay, but if you really grow hooked to the experience you can purchase the game for $3.99 on the App Store and $2.50 on the Android Market – and design till your hearts content – FOREVER! I hope that the game will get updates and perhaps some expansions in the future – but this is definitely a very simple, joyous experience I think any gamer looking for an educational, fun, and accessible game experience will enjoy! If you enjoy Game Dev Story – I’d definitely recommend checking out the other simulation games that Kairosoft has to offer. They’re all easy to play and easily accessible – and I think that’s what more and more games need to have. Check ’em out! I’m offering up a few Steam codes redeemable for Rochard. 1. I’m going to be posting a poster from Rochard, and it’ll be up to you to create a unique ‘catch phrase’ comment for the star character in John Rochard. 2. You’ll need a Steam account to actually redeem the code, so you’ll need an account to be eligible to win. 3. Post your ‘catch-phrase’ in the comment box and I’ll be keeping this contest running for 2 weeks time. After 2 weeks time I’ll filter through any participants and choose the top suggestions. 4. The Top 3 suggestions will be granted as winners and receive Steam codes to redeem. We’ll determine how best to get the code to you, I’m going to presume either Facebook messaging or email would probably be best. If you do – your submission will be deleted and you’ll be disqualified and will be unable to resubmit a new suggestion. I would like to keep my blog clean and appropriate and I don’t need vulgar responses mussing up my site. SO – if you’re ready and respect the rules of the contest – let’s get started! Show this space miner some love and give him a fitting catch phrase! Well, we’ve come to the wonderful, inspiring day of my week and I’m honored to be posting on this story. I just want to say thank you to my friend Matt for sending me this story. Thanks man! Today, we’re going to be talking about a gamer that I truly admire and respect for how he’s lived his life and how he’s allowed himself to still be able to enjoy the gaming world and his personal life with a joy for life rather than begrudging his personal struggles. His name is Matthew “LookNoHands” Fink – a prolific Starcraft player and amazingly inspirational gamer. This guy is fantastic - watch him play Starcraft and your jaw will drop. I only found one decent video interview with Matthew [ and it’s a long one ] but it’s phenomenal to see how positive he is towards life. He’s a brilliant mind and I applaud him for all his success. ESL TV did the interview with him, and I actually applaud them too for providing the interview with such respect and dignity to Matthew. Matthew’s positive outlook on life is something that should be truly cherished by everyone and I think it humbles all gamers and makes any of us appreciate the way we individually play games and interact with others. Matthew was born without a spleen and this caused his body to be massively susceptible to infections. He acquired an infection and it required the doctors to have to amputate his limbs at 1 1/2 years old. I’ve been in hospitals frequently throughout my life, and I’ve experienced what it feels like to be a hospital child – but I love Matthew’s attitude regarding his situation. He’s never known life without the situation he’s been given, and so he’s focused his life to benefit what he can do – rather than focusing on what he can’t. The fact that he’s a gamer on top of it all – is fantastic and the man is brilliant! BA in International Relations, PERFECT scores in Science and Math on SAT- and he’s planning on going to GRAD school for Political Science and MEDICAL school! Why does his story mean so much to me? I love that he sees his gaming outlet as a way to compete with others without any assisted adaptations – I can’t tell you how much that touches my heart and makes me admire this man even more. He’s a phenomenal player with a phenomenal view on life whose message – I hope will influence other gamers to realize how blessed they are and how humbled they should be for their plastic controllers and ability to use them. So – here’s to you Mr. Fink! I’m inspired by you man – you make me appreciate my life and humble me to look at my own physical limitations with a renewed sense of confidence. You are my Inspirational Gamer of the Week sir and I hope that your journey around the world to support the play of StarCraft 2 and accessibility for disabled gamers – helps to provide encouragement to others and open the eyes of future developers to see how truly remarkable some of their valued players can be! Fantastic gamer – fantastic individual – inspirational for sure! Well, I haven’t done one of these in a long while – but I think it’s time for a long overdue Developer of the Week post. This time I’m focusing on a company that I truly admire for giving the control of a game to the user and letting users merely play with tools to design their own gaming experiences. Media Molecule is the UK based company famous for the lovely family-friendly PS3 exclusives LittleBigPlanet and LittleBigPlanet 2. I’ve been a huge fan and advocate of the LittleBigPlanet series for years now, but what I’m most fascinated with by the Media Molecule crew is the amazing opportunities for accessibility in player designed levels. Umm... excuse me, but umm - might I get a nifty hat too? LittleBigPlanet is a one of a kind ‘creator’ game, and players are truly taking advantage of these design tools to create unique and meaningful little gaming experiences [ some of which I’m so fascinated by I wish they were their own PSN games ] Now while LittleBigPlanet and LittleBigPlanet 2 as games themselves, can often lend themselves to a few accessibility issues in the Story mode, I think that can be overlooked by some of the more artistic and fantastic designs that the online community has been providing. Media Molecule is a fantastic company for giving power to the players instead of just having them play through something that’s already been designed. Relaxed gameplay and mechanics allows for players to take their time with each move. This helps mobility challenged gamers to actually succeed and enjoy this game – even single handed players will be able to enjoy this as long as you’re willing to be patient with the controls. Color scheme is dark, but the main characters and puzzle pieces are illuminated in the darkened waters, which makes the game accessible for colorblind gamers and vision impaired gamers. Deaf players can easily play this game, while it’s disappointing that they can’t hear the warm, calming, melodic music, no sounds are required to play. This game is actually very simple and relaxing – so cognitively challenged players may actually enjoy this title. The controls only require you to hit the triangle button once to lock into your tea cup, and then it’s a matter of moving left to right on one single analog stick. This may seem like too easy of a game to care about, but it’s actually quite a fun experience with the frequency of sugar cubes being set at random. You may see an easy moment where there’s only a few and then you’ll get bombarded with quite a few. Precision is required, because you have to catch the sugar cubes in the cup to make them dissipate. This can make the game a tad more difficult for mobility impaired gamers, but still totally accessible. The music is good, but it’s not required to play and all instructions are displayed to you via text – which is fantastic for deaf gamers. Definitely makes the level more accessible for those with hearing impairments. Media Molecule gives players an ability to devise a game jam on a daily basis. They have millions of players devising millions of levels and with all of these vast creation tools and creators going forward there’s no wonder that these games are fantastic for the trend of accessibility being valued in games. Media Molecule, I just want to say folks, I love you guys. You have made a fantastic – trend-changing game, and I hope more and more community developers begin to devise games that are accessible to multiple players. LBP and LBP 2 have been two of my favorite games to play as an aspiring developer and I am fascinated by all of the lovely games I see coming out of the community and all of the advancements that you all have placed within the games’ look and feel. If anybody owns a PS3 [ especially if you’re a developer who owns one ] I highly suggest picking up these games. LBP and LBP 2 have deep creation tools that are easy to understand and access – and if you’re a more advanced designer you’ll be able to do even further fantastic levels with all of the advancements that LBP 2 has given. Check out Media Molecule and the LBP series. Their gameplay and game design tools are making a difference, and that’s why I admire them and nominate them for my Developer of the Week this week. I hope that the future of this company keeps going forward, developing ways to provide more and more accessibility to the masses and the levels that they create and those that they allow players to create. I can’t wait to see the future – and here’s to the waiting period for whenever they announce LittleBigPlanet 3. Well, with the prices of gas sky-rocketing to 4+ dollars here in recent weeks, it got me to thinking about something that I love and wish we had – space travel. You know, because honestly, if we’re dealing with a natural resource issue on Earth perhaps we can start to mine planets for their resources? – maybe even find new ones we never knew existed? – well, that’s pretty much the job description of this week’s game protagonist: John Rochard. What is it? How do you play? etc. Well, you play as the leader of a space mining crew named John Rochard. Your task, if you choose to accept it, is to guide John around and help search planets in search of a mineral known as turbinium. 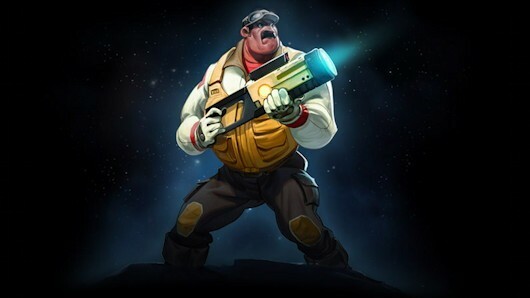 Rochard carries around a gravity-bending gun which you can use to help solve puzzles, access areas, defeat enemies etc. depending on the tasks at hand. Now I’ve only played the demo, and while it was shorter than I expected – it was an experience that definitely kept me wanting to see more of it – so that’s a bonus I think for any game. Here's looking at you Gravity. Do your stuff. The art design is lovely. Warm, bright, and meaningful color schemes truly give this game a touch that makes it worth checking out. It’s got a style akin to a steampunk/sci-fi comic book and I totally live for games like that. The dialogue between characters is witty and engaging and it’s completely subtitled, which makes for a wonderful experience for deaf gamers. The game gives you a nice tutorial using text to describe the actions you need to take, which helps deaf gamers gain accessibility to playing this game. The music is fantastic too – the opening cinematic really set me up for a joyous experience, and despite some qualms that I had, the game was one I’ll definitely be picking up. Deep, interesting, and invested storyline in a gravity puzzle game. Characters are truly charming and memorable. Rochard is a treat. Music is fantastic. I swear the game made me feel the gritty electro-vibe. The cinematics [ the few I saw via the demo ] were wonderful, and really added to the depth of gameplay as well as storyline. Puzzles are engaging and difficult enough to challenge players. Fast-paced action puzzler is something gaming needed: Rochard delivers. Full subtitled dialogue, as well as tutorial instructions for new actions. Color-blind gamers may have issues with the environments. Examples include when gravity is turned off, the entire environment turns into shades of blue, etc. but most color schemes in Rochard are vibrant and distinct enough to combat that – if any color-blind gamers have any problems please let me know. I’d love to receive personal feedback from your perspective. Cognitively impaired gamers will have a difficult time with this game – the puzzles are actually quite complicated once you get deeper into the physics pool that this game provides and can cause issues for some players certainly. So, overall, it’s a great little physics based puzzle game – and despite the few hiccups in accessibility, Rochard, is definitely a must see. I’m hoping that the PC version provides a little more assistance for gamers with mobility issues, but like I said, if you can get passed that – the game is truly rewarding. It’s got a slew of levels and interactive moments and it’ll definitely be one I put on my PSN download list in the future. You can catch it on Steam, PC, Mac, and PSN right now for $ 9.99 or for $14.99 on Steam you can get the game and the soundtrack as well [ and it’s fantastic! ] Thanks Recoil Games for such an enjoyable and rewarding gaming experience – I’ll be venturing into the great unknown of space for quite some time thanks to you! So I’ve sort of been on this whole love of foreign country games, and rightfully so. I think it has something to do with spring break [ and that thing I’m not usually acquainted with – sunshine ] I’ve just been musing – thinking about how glorious it would be for me to just be lounging somewhere peaceful. Perhaps I’ll think about going to a small little island somewhere off the coast of nowhere and just get lost in my peace and serenity – and then I realize… it’s just a dream, and I wake up. Ahh... all alone. Now where's my hammock? 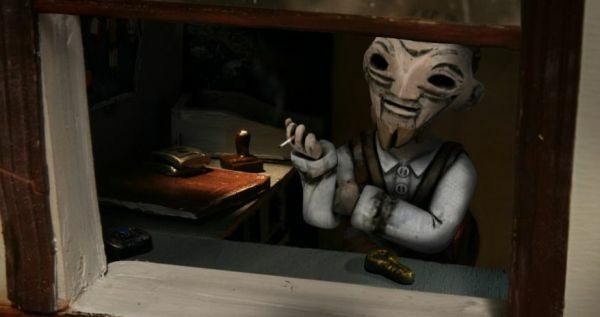 Well, if any of that made you think of the many maddening moments we all have during dreams, I’d invite you all to check out Swedish developers Cockroach Inc. and their delightfully mysterious indie title called The Dream Machine. It’s unique design, deeply interesting storyline, and odd enchanting characters make The Dream Machine a must check out. The game is divided into chapters and you can easily purchase each piece individually, but what I love is that they let you play through the whole first chapter for FREE. Now, why do I love this game? Well first of all – there’s the art style. Anders Gustafsson and Erik Zaring made this whole game out of clay and cardboard, which is why it charms it’s way into my heart as one of the most enjoyable artistic experience I’ve ever had in gaming. They have some fantastic little flash game experiences on their website, but The Dream Machine stands out. It’s a dark, yet engaging little art piece. The gameplay is point and click adventure game, but there’s a sense of narrative and mystery novel that I haven’t seen in games in a while. It may be simple gameplay, but it’s such an intriguing experience that you won’t let go. Can I help you? Look into my eyes! No audio needed, except music is great, which is a shame for deaf gamers. Point and Click for mobility impaired gamers. Easy gameplay with difficult puzzles and problem solving. Slight highlight and wording when you glide over clickable objects. Difficult puzzles, while great overall, problematic for cognitively impaired. Color scheme may make it difficult for colorblind gamers to play areas. Text is rather small so it can make for issues for vision impaired gamers. The game is filled with a rather deeper, darker, mature sort of storyline. Now while that last one really isn’t an issue with the gameplay, it’s more of a warning for players. The game is a deep cerebral experience and it often mentions disturbing mysterious dream sequences and I’ve encountered a few slews of curses within the text so far [ I’ve only played through Chapter 1 ] but the game is amazing with all things considered. Now, currently, their website is selling the FULL game [ All 5 Chapters ] for € 13.00 [ but more chapters will be added later ] It will require you to make an account with The Dream Machine‘s website to actually buy the game, but the game is entirely allowed with Cloud save access and allows you to play from any computer anywhere! It’s truly a dream game and a special little experience. I highly recommend checking out Chapter 1 and seeing what you personally think, but Cockroach Inc. has officially made a warm spot in my heart for noir/mystery art games. They’ve not only made an artistic masterpiece, they’ve also made it a highly accessible experience that any gamer should experience at least once. Thanks guys – I can’t wait to see what the remaining chapters have to offer!